I never used to use dumbbells at the gym. I don’t know exactly what it was, but the idea of using hand-held weights was just not in my fitness repertoire. Maybe it was intimidation, perhaps it was lack of interest, or maybe it was the fact that I was so focused on cardio that I didn’t care to understand the importance of doing anything else once I stepped inside the gym. However, one Body Pump class totally changed my mind. I realized that, with dumbbell workouts, you can target specific parts of your body to tone and strengthen. When you exercise, it’s important to be knowledgeable about what exactly you are doing to and for your body. It’s also essential to do varying workouts to ensure your body is reaping its maximum benefits. Of course cardio is great, but adding in dumbbell workouts post-run, for example, will leave you with even better results. The great thing about dumbbells is that they are incredibly versatile, effective, and easy to use. You can use them to work all different parts of your body including your arms, legs, core, back, and more! Plus, you can choose whatever weight you are comfortable with that’s appropriate for your fitness level. As you continue to do dumbbell workouts, you can always step it up in terms of weight if you want, but you can get great results even when lifting light weights. Another huge plus is that dumbbells are more joint-friendly than barbells. With barbells, your hands are in a fixed place, but with dumbbells you’re able to have a more natural movement and turn and rotate your arms as you need. This also makes it less likely that any injury will occur. And the greater range of motion ensures that your muscles are continually challenged. 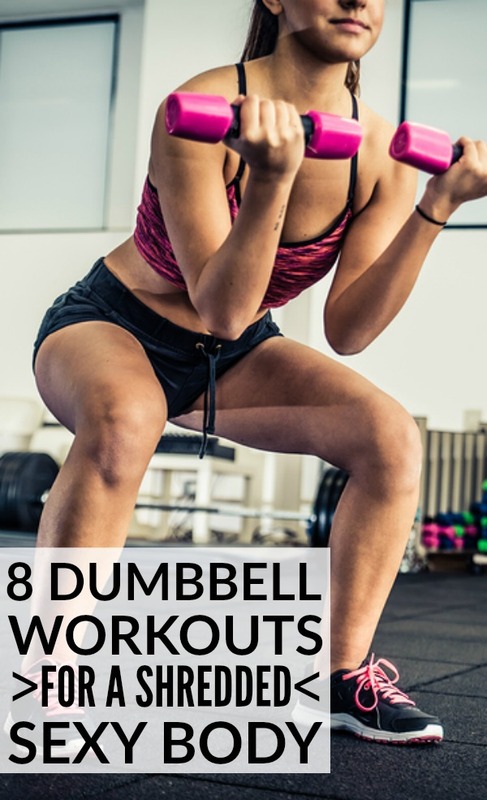 Plus, you can do dumbbell workouts right at home! Our schedules can fill up so easily, so for the days when you can’t make it to the gym, grab a fitness mat and dumbbells and work it out in your living room! Strengthening your biceps is important to ensure you’re not injured doing day to day things. You use your biceps to help you bend your arm and lift things, so it’s important to give them some love at the gym or in your at-home workout. This tutorial shows you step-by-step exactly how to do an effective bicep workout with dumbbells. Bicep curls target your biceps, strengthening and sculpting them. Work your biceps twice a week for best results. Toned triceps are at the top of the list for many people, as strengthening the area will make your arms look nice and sculpted on the beach wearing a bikini or in sleeveless shirts. You should be working your triceps 3 times a week, and another plus is that strengthening your triceps can also boost your metabolism. This 10-minute workout works both your triceps and biceps in an intense but fun combination. Your forearms are put to work in most arm workouts, however it’s still important to do workouts that specifically target them. It will improve your wrist stability, making it less likely for you to injure yourself, and it will also give you a better grip. Not to mention the benefit of well-defined forearms! There are three workouts in the video. The first two focus on strengthening your forearms in isolation and the final one works your biceps, incase you haven’t gotten enough of that already! Building strong legs is easy with dumbbell workouts. I always see the best results when I do leg exercises with dumbbells, especially squats! This video will take you through a leg-burning sequence, where you will add resistance and build muscle. Your legs are sure to look more refined and toned, just in time for summer! Working your abs can be challenging even without the addition of dumbbells, but adding them to your routine will leave you with amazing results! If you’re looking to tone and strengthen your abs, especially as we head into the summer months, this workout is for you! It’s definitely challenging, so if you are looking to work your abs at a more advanced level, try this one out! A strong core is what gives the rest of your body strength. It connects your upper and lower body, and most motions originate from your core, whether it’s everyday acts like bending over to tie your shoe, or sports activities like volley ball and rowing. Strengthening your core is a must, plus it will work to slim you down! Using dumbbells for your core workout makes the exercises more challenging, which means you will see better results. I love this standing dumbbell workout! I don’t know about you, but I don’t always think about doing back exercises when I workout, but they’re so important! Having a strong back benefits your posture and makes you less prone to injury. And if you’re looking to get rid of back fat, exercises that target your back are what’s going to do it! The very first workout in the series doesn’t use dumbbells, but all the other ones do. It’s almost 20 minutes of killer dumbbell workouts that will really work your fat and blast back fat. A strong chest works with other parts of your body such as your arms and core to produce power and movement. It also benefits your posture, and makes you look better over all. This video takes you through a number of chest exercises to burn fat, tone the upper body and build muscle in the chest. If you haven’t been using dumbbells in your workouts, these tutorials are a great place to start! They’ll tone and strengthen your muscles, while making your body look nice and defined! If you liked this collection of dumbbell workouts for a shredded body, please share it on Pinterest! And if you’re looking for more health and fitness related tips and workouts to help you lose weight and get back into shape, please follow our Health and Fitness board where we share all kinds of great ideas!